Wisemen's Way is a Christian bookstore with an impressive array of gifts, cards, books, music, movies and Hwy more. 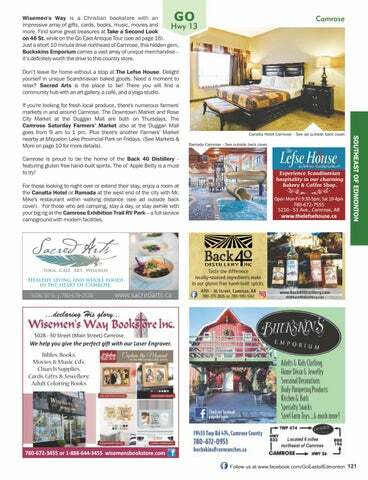 Find some great treasures at Take a Second Look on 46 St. while on the Go East Antique Tour (see ad page 16). Just a short 10 minute drive northeast of Camrose, this hidden gem, Buckskins Emporium carries a vast array of unique merchandise – it’s definitely worth the drive to this country store. Don’t leave for home without a stop at The Lefse House. Delight yourself in unique Scandinavian baked goods. Need a moment to relax? Sacred Arts is the place to be! There you will find a community hub with an art gallery, a café, and a yoga studio. Canalta Hotel Camrose - See ad outside back cover. Ramada Camrose - See outside back cover. Camrose is proud to be the home of the Back 40 Distillery featuring gluten free hand-built spirits. The ol’ Apple Betty is a must to try! Experience Scandinavian hospitality in our charming Bakery & Coffee Shop. For those looking to night over or extend their stay, enjoy a room at the Canalta Hotel or Ramada at the west end of the city with Mr. Mike's restaurant within walking distance (see ad outside back cover). For those who are camping, stay a day, or stay awhile with your big rig at the Camrose Exhibition Trail RV Park – a full service campground with modern facilities. Healthy living and whole foods in the heart of Camrose. If you're looking for fresh local produce, there's numerous farmers' markets in and around Camrose. The Downtown Market and Rose City Market at the Duggan Mall are both on Thursdays. The Camrose Saturday Farmers’ Market also at the Duggan Mall goes from 9 am to 1 pm. Plus there's another Farmers' Market nearby at Miquelon Lake Provincial Park on Fridays. (See Markets & More on page 10 for more details). We help you give the perfect gi with our Laser Engraver.